Welcome to the St Paul's RC Church Cantley website. We hope you enjoy browsing our site and invite you to contact us or to join us at any of our masses. 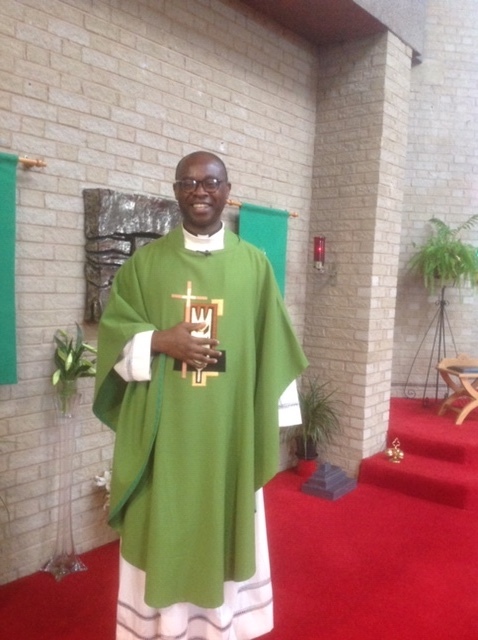 Welcome to our new parish priest Father Evangelist Ohaejesi. Father Evangelist joins us from his previous parish of St Joseph's in Wath Upon Dearne. Please pray for him as he begins his ministry in Cantley. Tim Harrington, Kathrine Sadler, Andrew Gormley, Ian Prior, Tina George, Christine Adams, Phyllis Allott, Lisa Thompson, Elsie Murphy, Sioned Harper, Len Jackson, Eugene Fox, Ken & Cathy Ward, Benjamin Bates, Alice Whitehouse, Joan Whitehouse, Deacon Derek Wynne & Ryan Chilvers, who are sick. 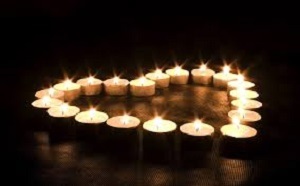 Please also remember in your prayers Charlotte Woods, who has died recently and her grieving family and friends. When Judas betrayed, he thought he would have the last laugh. When his friends and colleagues turned against him, they thought he will never come out of it. When Herod and Pilate unjustly condemned, they thought all powers belonged to them. When the soldiers mocked him, scourged him, abused him and nailed him to the cross, they thought that they have done away with him. When the authorities connived with the guards at the grave to tell a lie about his resurrection, they thought their lie will last forever. Here we are today still telling the joyful story that he is indeed risen, that darkness shall never prevail over light nor evil over good. 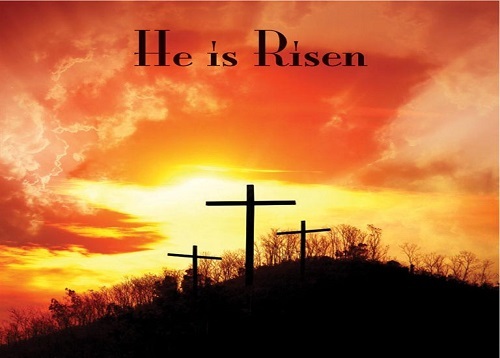 Here we are today with hearts full of joy that Jesus is indeed risen. Here we are today with hope and courage that we will always rise from our many failings in life. He has given us victory through his resurrection. The darkness of betrayals, injustice oppression, and the grave will never overcome the light of the resurrection. We are a joyful people because he is risen. HAPPY AND JOYFUL EASTER TO ALL. Thanks to all those who made it possible for us to celebrate a fulfilling Easter. May the risen Christ always bless and be with you. Fr Evangelist Chimezie Ohaejesi was born in 1972 and ordained a Priest on 24th August 2002. He served as assistant Priest and then later as Parish Priest in the Orlu Diocese in Nigeria. He served as Chaplain to St Damian’s School of Health Technology Okporo from April 2006-9, also in Orlu Diocese. He is a Member of the Council of Priests and Member College of Consultor, Diocese of Hallam. For those of you with 2019 diaries I have already made a provisional booking for Tuesday 17th and Wednesday 18th of September 2019. Please look on the Main Menu for the Walsingham 2019 Tab for the itinerary and tariff. Please contact me on 07790 533073 or stuartcgrantham@outlook.com if you would like to reserve a place. With effect from Sunday 28th April Mass at St Paul's will be at 9.00am. The change of Mass time is as a result of Fr. Evangelist taking responsibility for the parish of Christ the King at Rossington where he will also be saying Mass at 11.00am. ‘Diocese of Hallam, St. Paul’s Doncaster’. We’re hoping to recruit some new altar servers to boost our great team of parish servers. If you would like to join the team and you have already or are about to receive your First Holy Communion you are invited to apply. Application forms are available in the Church Entrance Hall or please speak to Father Bernard or Deacons Bill and Chris after Mass. We have a great tradition of music in our liturgy and young people over the years have performed at our services. Along with the coming of the Baby Jesus, is the coming of a Baby Grand Piano. Jeanette, a friend from America has given us a piano. If there is enough space, it will grace the church and enhance our musical tradition. Anyone who can play and would like to join our Music group, is welcome. It should arrive before Christmas, but it will take a few weeks before we decide on a position, tuning etc. Anyone is welcome to join our music ministry; we rehearse on a Friday night at 7pm for the weekend Masses. We are urgently looking for fresh volunteers for our Children’s Liturgy Group and Catechists for the First Communion Course. Helpers with the Children’s Liturgy join a rota (one Sunday out of 5), will be given help and materials and must love children. Catechists meet once a month for seven months and primarily assist parents to deliver the course materials and love to see the light of faith in children’s eyes. Can you consider taking your turn?